Plastic containers for the chemicals, inks and dyes industries. Here at H&O we do a lot of business with manufacturers specialising in the production of chemicals, inks, dyes and other pigments. Our plastic containers are ideal for the storage and handling of sensitive materials which have the potential to harm the environment or even the people they come into contact with. H&O Plastics only make high quality containers; we use highly-resistant polymers in our buckets and use more raw material than other competitors in the market. This means that you can be sure that an H&O container will be tough when it counts, making them the perfect receptacles to store hazardous liquids in. Businesses must take a long list of precautions when transporting or storing chemicals on-site. Those involved in handling potentially polluting materials need to be specially trained – and they need to be able to rely on their equipment. Guidelines from the Environment Agency suggest that the first line of defence is in the ‘primary’ container. This is usually the smaller bucket or drum in which a chemical is stored or transported. 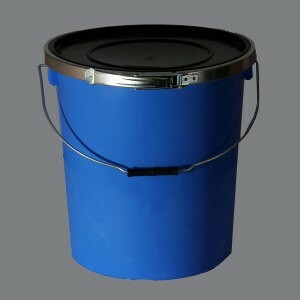 They recommend that for absolute peace of mind, you use specially designed UN Containers. These approved containers come with a secure lid, as well as a rubber fitting and protective metal strap to ensure they are 100% leak proof. This is especially important when storing or transporting sensitive liquids. If you are involved in these kinds of activities it is imperative that you frequently check for signs of stress in your stock of primary containers – and replace any containers which show visible signs of damage. Here at H&O we are proud of delivering a superior product – we are confident in assuring all of our clients that our buckets are among the sturdiest and most hard-wearing. We make sure to check all of our containers during the development stage of production and faults and breakages are absolutely minimal. This means our containers do not have to be replaced as frequently as more flimsy imports – saving your business money in the long run. The other advantage of using H&O Plastics to store and transport your chemicals is that we manufacture and stock a huge range of tamper proof containers. We know how important this is when dealing with sensitive materials. It means you and the customers you are distributing to can be safe in the knowledge that a product hasn’t been interfered with in any way before it reaches its final destination. You can browse and purchase small volumes of our heavy-duty plastic containers online. Or if you wish to make a larger order, please call a member of our team on 0151 639 0002.